NintenGen: Playstation 3 losing exclusives=more Wii development? 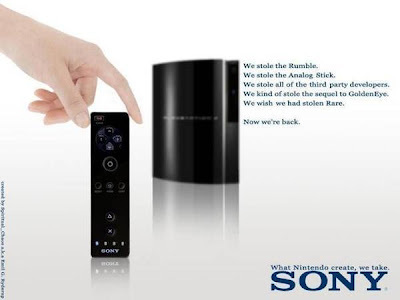 Playstation 3 losing exclusives=more Wii development? Microsoft would want to buy them. But can they afford to? The entire Xbox venture has cost them billions with little in return. And the last studio acquisitions were not exactly good investments for the company, I should add. Buying Rare was, in hindsight, a mistake. The studio cost Microsoft almost half a billion US dollars, graced the console with a number of overhyped titles (two of which had been ported twice in their development cycle, to be fair to Rare) and the buyout started a huge exodus of employees which recently culminated in the company founder's leaving. There's also another third-party exclusive PlayStation title that's coming onto the Xbox 360, Ace Combat 6. And do want to know what the sad thing is? It wasn't even announced for the PlayStation 3. Let's not forget about Devil May Cry 4. Who's next? GTA would be nice since Rockstar is bringing Manhunt 2 to the Wii, why not? It might as well be Metal Gear Solid 4: Guns of the Patriots and Final Fantasy XIII. If third-party companies want to cover all their bases on this 7th console cycle, there's going to have to be some sacrifices like their exclusive deal with Sony. Phil Harrison even admitted that the PlayStation 3 won't be enough for big titles like Grand Theft Auto IV. Even if some of the black sheep of Sony's PR management have relinquished some of their arrogance, we're still seeing some PlayStation exclusives heading to the Xbox 360. Processing power has absolutely no factor in this equation anymore because the PlayStation 3 and Xbox 360 are too close in terms of performance, and developers want to take advantage of the console that's more profitable.